Seventeen-year-old Klee's father was the center of his life. He introduced Klee to the great museums of New York City and the important artists on their walls, he told him stories made of myths and magic. Until his death. Now, forced to live in the suburbs with his mom, Klee can't help but feel he's lost all the identifying parts of himself—his beloved father, weekly trips to the MoMA, and the thrumming energy of New York City. That is until he meets wild and free Sarah in art class, with her quick smiles and jokes about his "brooding." Suddenly it seems as if she's the only thing that makes him happy. But when an act of betrayal sends him reeling, Klee lands in what is bitingly referred to as the "Ape Can," a psychiatric hospital for teens in Northhollow. While there, he undergoes intensive therapy and goes back over the pieces of his life to find out what was real, what wasn't, and whether he can stand on his own feet again. 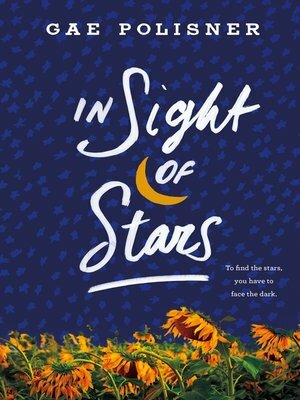 Told in alternating timelines, leading up to the event that gets him committed and working towards getting back out, Gae Polisner's In Sight of Stars is a gorgeous novel told in minimalist strokes to maximal effect, about what makes us fall apart and how we can put ourselves back together again.